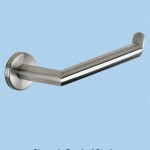 The Urban Steel Range of Bathroom Accessories are manufactured from stainless steel and are cut to a minimal design, in your home bathroom accessories are meant to suit the simple purpose they were designed for and that is exactly what this range does, in Brushed Steel (toilet roll holder left) which is very architectural in look it looks stunning but hard to find other matching items to complement the finish apart from stainless steel heated towel rails. 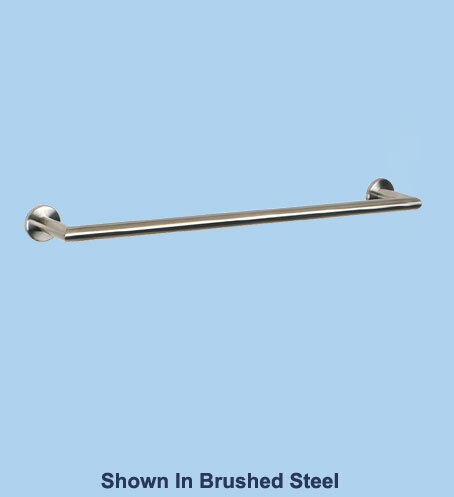 Chrome bathroom accessories are selling in much larger numbers and there is so many items in the bathroom that are easy to match to this finish. 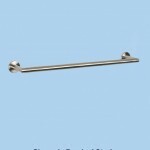 In the range there are four sizes of towel rail 30, 45, 60 and 80cm and a 60cm double towel rail and fixed towel bar that projects 450mm out from the wall which would sit nicely next to a bathroom sink or basin. You have a toilet roll holder and a spare toilet roll holder even a double toilet roll holder just in case you get caught short, the range does not stop there either there is a glass shelf which is 60cm, a robe hook, towel ring, towel rack, a grab bar, glass soap dish, glass soap dispenser and a glass tumbler, a metal soap dish and some free standing metal accessories a soap dish, soap dispenser, freestanding tumbler, beauty box, and just to finish off the full complement of products a freestanding toilet brush set. 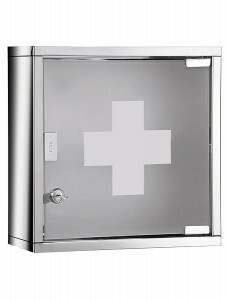 Wow a lockable stainless steel cabinet for bathroom or utility at just £53.00 have Tapstore.com gone mad. I really like this little glass doored medicine cabinet and finding bathroom cabinets with locks on them is not easy believe me I have looked. It is only 300mm x 300mm x 120mm deep so would even fit inside a kitchen unit as well. The cabinet itself is manufactured in stylish stainless steel with a frosted glass door with a clear medical cross in the middle. Inside there is a single fixed shelf which gives good storage space. 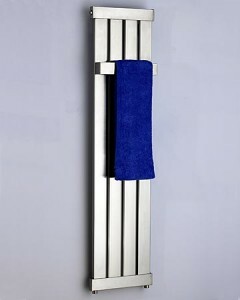 Available from Tapstore.com for just £53.00 with delivery to your door for £6.50. 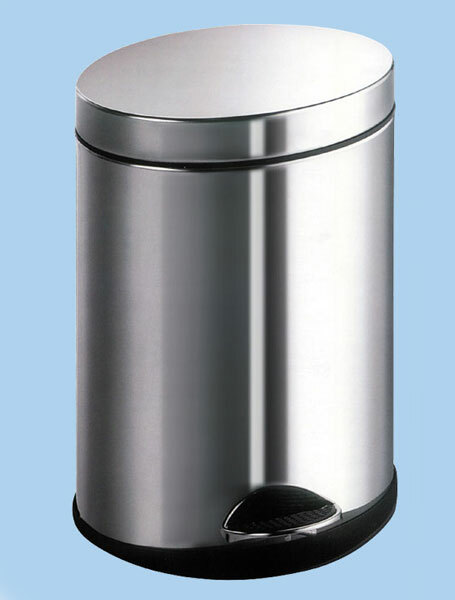 Bathroom pedal waste bins are not the first item when considering designing a layout but if they are not considered from the start they can sit in an uncomfortable position in the room. I like the Oval bathroom bin from Tapstore.com as it has a 5 liter family capacity made from durable and hygienically safe stainless steel finish. It will sit in the corner of a room with out taking up the space due to its small projection compared with a round pedal bin. 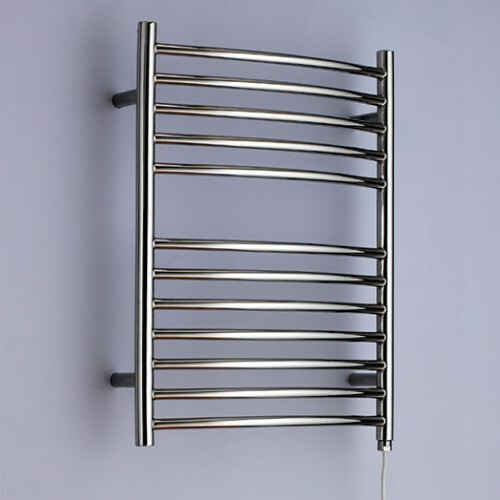 Heated Towel Rails – It’s that time of the year. 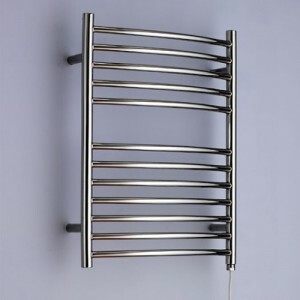 The Hove Heated Stainless steel towel rail is another fine example of the Sussex range from JIS, being Stainless steel it will give you at least 25% more heat than the standard chrome towel rail will produce and will not ever rot so you will pay more but the quality shines through with these towel rails. To complement your new Hove designer radiator and to add that extra finishing touch that brings with it the practicality of somewhere to hang your towels they offer these useful towel hangers which are just as stylish as the rail itself.